Bean's World: My Disney Creations, Thanks to the Disboards, Part 1. Just wanted to let you know that your whole name is on the tshirt. and when you click on it, it's not even hard to read. 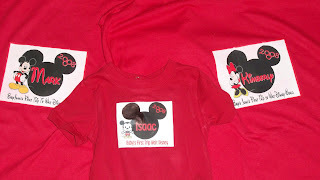 I have to say you did a great job on the shirts, onesies, bibs, and pillow case. That's creative! I love the Prince Charming bib, so cute! 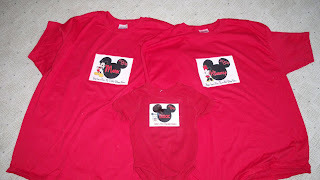 For the Magic Kingdom, I would wear the Mom, Dad, and Baby in mouse ears. And names when you go to Chef Mickey. I remember Florida water, oh my it was nasty! My first time in Florida, I took a sip just to see because my dad's ex wife said it would give you the runs. Plus it has a weird smell. That's a good idea what your doing for water, and what a great price as well! I hope you and Mr. Bean enjoy your trip with Lil' Bean! thanks Alexia, I didn't think of that - I fixed the ones with the last name, taking it off! And Thanks Mrs. Pi! We plan on having a blast!